One of the main questions that my doctoral students have asked me most frequently is “how do you structure your daily work routine, professor?“. While I am a scholar of neoinstitutional theory and I know the importance of routines, I have to confess that I don’t think about my own daily work routine often enough to share a clear outline of how I work on a daily basis. BUT I also love Dr. Eva Lantsoght’s series “How I Work“, in which she interviews schoars who describe their daily routines. I do love structure, perhaps a little bit more than I should. I am very regimented with my daily routine (wake up, write/read/analyse data/exercise/shower/run to campus) but at times, I wonder if having very rigid daily schedules has been counterproductive. I will admit that for the most part, no. I like structure, routine and discipline and a regimented life. When I was a teenager, having this kind of “militarized” daily routine was super helpful to me: I had a lot on my plate and juggling all my tasks required smart planning and thinking very systematically about what my long term priorities were. At the time, I was doing competitive dancing, high-performance volleyball and volunteering for adult literacy campaigns, so I had to wake up at 5 am to head to the gym and train for 2 hours, then go to school, then train volleyball for 2 more hours. Once I was done with volleyball training, I still had to do 2 hours of dance training, then focus on my homework. After finishing my assignments, I still had to do volunteering, so these commitments required me to be very, very strict about not wasting my time. I feel lucky I retained this kind of thinking and regimented discipline throughout my undergraduate and my Masters and PhD. Being disciplined and systematic about my daily routines has helped me sustain a regular research and writing practice, particularly because I get distracted rather easily. Unstructured time in the summer is really difficult – I totally hear you. I have to more or less create some structure for myself, some habits I'll keep (like, coffee at place A every morning, library every afternoon) otherwise the time overwhelms. 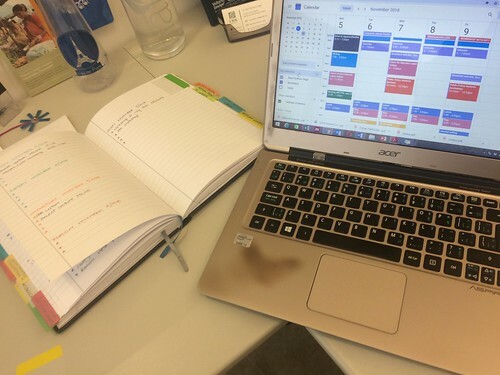 So when my doctoral student asked me what my daily routine looked like, I figured I had to write a blog post to share my thinking on this issue. 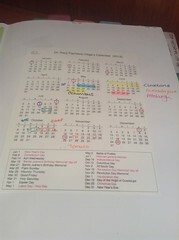 I plan for the year, then break down my commitments per month (using printed monthly calendars, and by hand), I insert my standing commitments in my Google Calendar, and on my Bi-Weekly Project Whiteboard, and then I write my Weekly Plan and daily To-Do List’s (5 items, 4 items, 3 items through Granular Planning and the Rule of Three, or 2 – through the #2ThingsADay strategy – items, depending on what I can actually accomplish that day). The core of my planning system, obviously, is my Everything Notebook. At the end of every day, I try to leave my desk cleared and my work papers organized so that when I come back the next day, my working spaces and areas are perfectly organized. That way I can work without worrying about organizing my desk or where a specific paper went. I don’t waste time in the mornings organizing stuff because I put order into my things the previous day/evening/night. I know many people loathe the idea of as much structure as I give my life, but I have found that if I don’t do this, I am lost. Hopefully my process will help my students and anybody else who reads this blog post! One thing that I think is important to add is that if you have care duties (children, parents, etc.) I believe that you should schedule everything around those commitments, not all the other way around. For example, one of my doctoral students has to pick up her kid at 2pm. I told her to work from home in the morning, pick her child up, have lunch with him and THEN come to campus. This routine works better for her. As someone who is childless and single, I am keenly aware of how parenting and more generally, care work can become a hurdle for doctoral students and academics/post-doctoral researchers. So, I try to make my planning processes as family-care-friendly as possible. I champion a more human, kind and humane academia and therefore my strategies, mentoring approaches and routines reflect this belief. Tagged with AcWri, productivity, research, routine, writing.